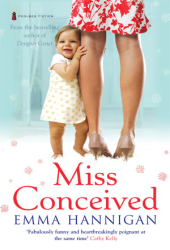 Miss Conceived by Emma Hannigan is a story of three women ~ Angie, Serena and Ruby, all different from each other in age and personality, on their rocky road to motherhood. The story is set in Ireland. This is the author's second book, first one being Designer Genes. To know more about the author visit here. Angie Breen, at the age of 40 is successful in her career but is still single. This is not the kind of life she thought she would be living at the age of 40 and she is worried she might end up single and childless. Her life changes when she expectantly discovers she is pregnant after a night sling with some one she barely knows. Serena Doyle is the ultimate epitome of glamour and sophistication. Married to a dynamic businessman, she wants to be a mother to complete her perfect life. But fate has planned something else for her and she struggles to conceive. It turns her life upside down and in the quest of conceiving she discovers a startling secret about herself. Ruby White, a 16 year old girl is infatuated with her best friend's father - Damo and after a eventful night in a pub ends up bearing his child. Her parents are worried and conjures up a plan to save her daughter's future. What will happen to Angie, Serena and Ruby? Is Angie's pregnancy a blessing in disguise? Will Serena be able to cope up with the circumstances that has marred her perfect life? What future has in store for Ruby and her baby? That's the story all about. Absolutely Chick lit. After reading the book, I have mixed feelings for it. It took me almost 3 weeks to finish this book and I could not read more than 3-4 chapters in a go. May be the baby related drama was just too much to take at a go or may be I was also spending a lot of time watching the Cricket World Cup. The writing style is not very appealing and some times, I felt I could not to connect to the story. I liked the character of Angie as she seemed real and was kind of annoyed with Ruby at the beginning. Infatuation with your best friend's dad, thats too much to digest! She seemed to be a careless teenager but through the end of the novel, one could feel the way she matures. The novel is written in third person switching between Angie, Serena, Damo and Ruby. The characters are well developed but there is something amiss which makes the story monotonous if read at length. It was sort of one time read and I would recommend it to someone who likes full blast chick lit stuff.